Lifetime Tables - 280118 Almond 48 inch x 24 inch Almond Table with Carrying Handle. 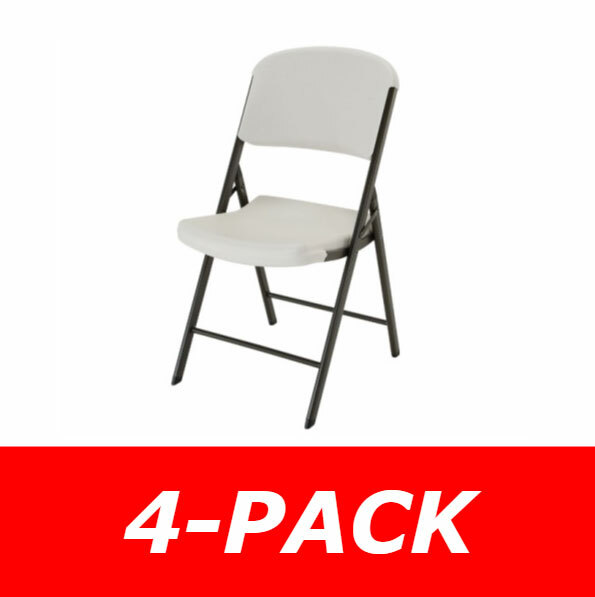 Shipping included in the price for this Lifetime Folding table with carrying handle. 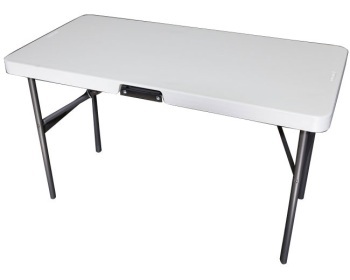 The 280118 folding table from Lifetime Products allows you to easily transport and handle this table. The table top is 48 inches long and 24 inches wide. The table also reaches the table-standard height of 29 inches. Need to set up and take down a display quickly? This lifetime folding table has a convenient black handle that allows you to grip and move the table with one hand if your arms are full. As a display table, the 280118 is a great product as it is able to hold up to 700 lbs. of evenly distributed weight. Finally, this product is backed by Lifetime Products' 10-year warranty so you can be a assured a long life of use. Measures 48 inches x 24 inches. Almond colored top. Almond is a mixture of a gray and brown. Table top has a black handle on the side for convenient carrying and storage. Table measures about 2 3/8 inches thick when folded. Handle is spring loaded and retractable. Table top made with polyethylene plastic. Easy to clean and maintain. Steel frame is powder coated to resist rusting. Frame height puts the table height at about 29 inches. Steel frame able to support up to 700 lbs. of evenly distributed weight. Powder coating allows this table to be used both indoors and outdoors. Table weighs about 23 lbs. unpackaged. Package weight: about 29 lbs. Package Dimensions: 51 inches x 24.38 inches x 2.5 inches. Products ships via small package carrier, i.e. FedEx. Orders generally leave the warehouse within 3 business days of placing the order. FedEx generally delivers the package within 3-6 business days depending on proximity to the warehouse in Clearfield, UT. The polyethylene plastic table top is stain resistant to most chemicals the top may be exposed to. Because of this, generally cleaning only requires soap and water and a little elbow grease. Some stains are a little tougher to deal with. For instance, paint is a little more difficult to get out. For tougher stains like pain, use a mild abrasive to get some extra power to remove chemical from the table. 80118 Lifetime Table - This listing is for a 19 pack, pallet load of the 280118. 22645 Lifetime Table - This folding table is a larger table with a top measuring 48 inches long and 30 inches wide. First of all, the 280118 has a convenient black carrying handle to help transport the table. The 80161 does not have this feature. And Second, the 80161 can adjust the height of the folding table; whereas the 280118 cannot. I had a table similar to this (but white) which I purchased at Costco several years ago. I have wanted another and have been unable to find it. This was a perfect find and easy ordering. Thank you! Dimensions: 51" x 24" x 3"